Writing is a passion for many but dedication to the craft is rarely seen as with my talented guest today! Writing daily on her blog, two books as well a cute storybook for kids Ruchira is a powerhouse of stories. Today, she shares with us a wonderful, tender, love-filled story. 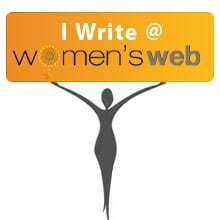 It is a fictional piece that she specially wrote for this blog and all you rocking readers! So go ahead read and share some love. Don’t forget to tell us how you liked the story – both Ruchira and I would love the feedback. Aryan was holding his Nanaji by his arm as they stepped out of the airport. The weather was similar to their homeland thus, none of them complained. As Aryan waved a taxi, the old man got a chance to catch his breath and looked around. He started comparing today’s Faisalabad to his Lyallpur in the 1940’s period when he was a child and was amazed how things had changed since then. But then, he realized that for anything to progress, change is the universal core. Delhi, his hometown was also not the same since he immigrated in 1947. “Nanaji, come,” Aryan called out to him loudly while extending his arm towards him, breaking his chain of thoughts. He nodded and boarded the taxi, giving out a street’s name that made the driver twitch his eyebrows since no such lane existed. Aryan gave a deep sigh. He had anticipated some of these hurdles prior to taking his grandfather on this journey, but his parents urged him to be sensitive since it was an old man’s bucket list. Anything to put a smile on his grandpa’s face. He interjected by asking his Nanaji about any landmarks that were close by to his home? There was a pause, and then he gave the name of a Masjid a few kilometers away from his address. “Oh! That is on the outskirts of this city,” the driver commented in a jubilant tone at the thought of getting a lump sum fare. Aryan would glance at his Nanaji now and then, who was looking out the window as a child curious about life and its existence. He put his hand over him to assure of his presence. Nanaji put his other hand over it to show his appreciation. Aryan had heard so much about Atif and his Nanaji’s adventures as a kid that he had wished for simpler times too. That brought a smile on his grandfather, as he looked at him with tired yet excited eyes. After an hour or so of a bumpy ride, the car slowed down as it approached the mosque. The paths seemed somewhat familiar for Nanaji, and he could guide the driver towards his childhood home. Finally, the car stopped, and Nanaji was staring at the house with moist eyes. Aryan helped him out and asked the driver if he could stay for a couple of hours since they had a flight back to Delhi. After the driver had negotiated a price, he went and parked his car near a tea stall. Seeing his grandfather hesitate at the entrance, Aryan went ahead and knocked on the door while holding him with the other hand. A young woman opened the door and had a frown for the strangers. She immediately put a dupatta over her head and asked who they were. For a few minutes, Aryan was captivated by her big brown eyes that were penetrating yet eager to know. Even though she was inquiring via those full lips of hers, it seemed musical to him. After a deep inhalation that brought him back to reality; Aryan gave their introduction. Aryan acknowledged this ruefully, but Nanaji could not let this moment go. “Yes, Yes. He and My Nanaji were childhood friends.” Aryan clarified with a quick smile. “Hold on. I will call him,” as she rushed out to knock on his door. Aryan peeped after her, but they both chose to stay put at the entrance. After a few minutes, Atif came walking with a cane in his hand. He had thick glasses, and he positioned them correctly to scan the old man who declared that they were childhood friends. Nanaji was quick to nod as tears were rolling down his eyes. Aryan gave way to both the old men to bond and sob alternately. Followed them in, and sat in one corner while eyeing Mustafa now and then who was making tea and laid out snacks on several plates. Soon the table was set with a dozen of plates and tea cups. The old men were too busy to eat or drink since they had a lot to catch up on while wiping tears off their cheeks. Aryan and Mustafa sat in one corner trying to mingle while she was offering him now and then. This time, her dupatta was over her shoulders, and she was looking relaxed, as the acquaintances were not foreign anymore. “Where do you live?” she inquired meekly with her eyes gazing in another direction. “Delhi” replied Aryan while noticing her sharp and dazzling features and her wheatish complexion that was making his heart beat faster than usual. Mustafa nodded while raising her eyebrows and placing a stray lock of hair behind her ear. “You must be a brave soldier” she responded in appreciation while admiring his broad shoulders and athletic look that could be visible via the half sleeve shirt. “Well, I try my best to keep a bold face.” he jested. That remark made her chuckle, which was followed by a blush that made the Captain pause for a brief period as his heart fluttered like a butterfly. After taking a few inhalations to steady himself, “What do you do?” asked Aryan in a delicate voice. “Aha! That is one language I have wanted to learn since a decade now,” he spoke in a husky tone while admitting. “Could you by any chance tutor me online?” he requested with an earnest tone. Mustafa was quick to look into his eyes to see if he was joking or serious, which was followed by a gentle nod and a shy smile. However, the two old men were going on fervently. Aryan kept a tab on the clock, and as he was nearing to their departure time, he alerted his Nanaji. At a first Nanaji did not like the reminder, and he had a pouty face, but then came to terms, and nodded, and came to business. They were in that position for a long time. Then Aryan broke the silence by getting up. He touched Atif’s feet and sought his blessings while writing down their Delhi address on a notepad with telephone numbers. “I was serious on the learning part.” he admitted while handing the pad to Mustafa along with his email address with the hope to hear from her. “Apply for a visa, Atif.” appealed Prem before sitting in his taxi. Soon goodbyes were said with moist eyes; the taxi started driving towards the airport. Aryan spent the remaining few days of his holidays with his family and friends, with a now a then check on the web for a particular email, but no luck. A little dejected, he joined work. In a few months, Aryan got a call of his Nanaji’s passing away. He was devastated and started homebound. When he reached, he was surprised to see Atif Chacha and Mustafa. After finishing off with all the cremation rites, he sat next to his guests from abroad. At first, he wanted to confront Mustafa for not initiating the conversation, but she signaled him to follow her and after digging in her suitcase she handed a folder to him. Curious, he opened and was delighted to see a complete tutorial on the language, hand-written. He was overwhelmed and hugged her; she did not resist. “Why didn’t you tell me? I kept waiting for your email.” he confessed as they sat next to each other while he was browsing through the folder. With her downward gaze “I thought I could go to an internet store; create an account, and take our friendship further via online chats, but” she paused. Aryan placed his hand over her shoulder, “No Regrets. What is done is done!” with a gentle smile. “So, where do we go from here?” Mustafa inquired hesitantly. Just then they heard Atif Chacha sobbing loud and hard. That prompted Aryan and Mustafa to enter that room. Aryan recognized the book that Atif Chacha was holding since it had his Nanaji’s childhood memories stocked with his dear friend, Atif before they were forced to leave due to political reasons. He had heard of all the risky undertakings these two had unraveled in their short lifespan together, and wondered if they had been together, they could have uncovered the dust off each stone present on the face of this planet. The last sentence, at first, put everybody in the room at Red Alert with their eyes wide as possible as if a siren just went off. Aryan’s mother was the first to react with a big frown but got grounded by her husband with a gentle pat and whispers that made her nod gently as she eyed Mustafa, who was equally shocked by Aryan’s public statement without being notified prior. Atif Chacha had no reaction. That was followed by gentle chuckles from all while Mustafa blushed and looked at Aryan, who winked back at her. It was a delight n honor for me to be on your blog twice, Indy. Thankyou for giving me this space. Wow ! That story brought a lump.to mu throat! So beautifully woven! Thank you so much Shilpa.